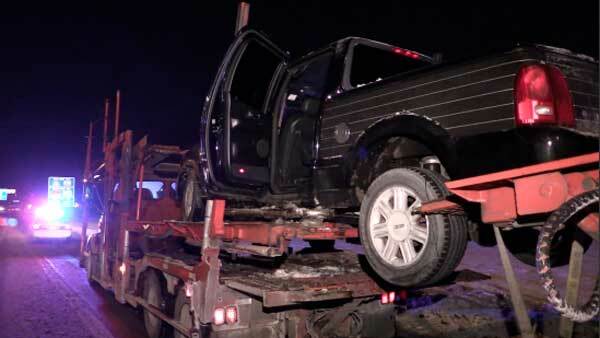 CALUMET PARK, Ill. (WLS) -- Illinois State Police are looking into why the person behind the wheel of a pickup truck drove onto the back of a full-size car carrier on the Bishop Ford Freeway (I-94) near East Sibley Boulevard overnight. The semi was traveling south on the Bishop Ford around 3:30 a.m. Thursday when the driver felt something impact the carrier, authorities said. The driver thought the truck may have run over something or blown a tire. But when the driver pulled over to check, a pickup truck was sitting on top of the car carrier. The semi driver called state police. Neither the semi driver nor the driver of the pickup were injured in the accident, but police said the driver of the pickup was taken to Munster Community Hospital to be looked at.